Download Book Sample Download Press Kit Purchase Signed Hardcover Press Release Media Appearances Play the Game! Play the Game of Uncomfortable Ideas! 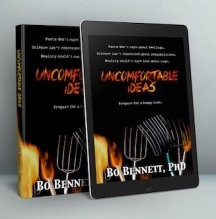 This is a book about uncomfortable ideas—the reasons we avoid them, the reasons we shouldn’t, and discussion of dozens of examples that might infuriate you, offend you, or at least make you uncomfortable. This is the preface from the book,"Uncomfortable Ideas." Do you have any questions about the book for the author? Browse the answered questions or ask a new question. All questions are answered promptly. Download the full press kit if you are interested in possibly writing about the book or booking Dr. Bennett for an interview. "This whole book is one big trigger!" "I didn't agree with all ideas presented in the book, but I did agree with the reasoning. Really made me think." "This book should be required reading for all college students!" Buy the Audiobook. Get this from audible.com. Enroll in The Course of Uncomfortable Ideas. Over 6 hours of video and interactive learning. Go beyond the book! Enroll in the FREE Course of Uncomfortable Questions. Sit back and learn fallacies the easy way—in just a few minutes per day, via e-mail delivery. Play the Game! This is the perfect game to play with friends and family when the goal is to have many akward moments.